You learn all kinds of strange things doing a project like this one. 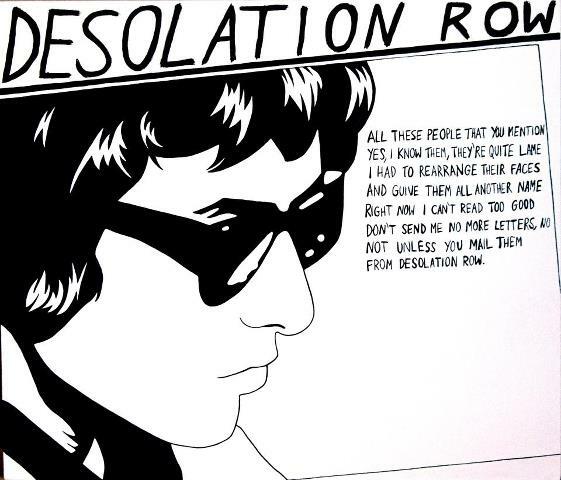 For instance, today at lunch I learned that “Desolation Row” is funny. I certainly never knew that before. I always considered it the dark, brooding, beating heart at the end of Highway 61 Revisited – a typical Dylan apocalypse straight out of a Dutch painting. To the earliest crowds hearing the song, however, it was a laugh riot. Dylan started playing “Desolation Row” as part of his tour of the United States with The Hawks in the fall of 1965. On that tour, he would open with seven or eight songs sung alone and acoustic (almost all from his more recent albums – the protest stuff, even “Blowin’ In the Wind”, was gone at this point), and then after intermission he would return to the stage with The Hawks and play most of Highway 61 Revisited. “Desolation Row”, having been done acoustic on the album, was played that way live (an electric version of the song was recorded for Highway 61 and can be found on Bootleg Series 7 – it’s not a whole lot different, but in some ways it may be better than the album version). I only have two bootlegs with “Desolation Row” from 1965. The first is a poor quality recording (likely from the crowd) of his show at the Forest Hills Tennis Stadium in New York. The crowd laughs – loud and long – after virtually every single line of the song. This crowd thinks that this song is hilarious. “They’re selling postcards of the hanging…” and they laugh. I always thought that was a pretty sombre image, myself, but what do I know? The far better recording I have is of his Hollywood Bowl concert in August. This is a high quality version, and just before “Desolation Row” Dylan tells the audience he can’t hear them (presumably in response to a song request). Even here, though, from a soundboard recording, you can hear the audience laughing – though not as clearly. It seems to me that Dylan’s obscure non-sequiturs – which comprise such a huge percentage of the lyrics on Highway 61 put the crowd at a loss. How to take this protest singer, whose language had once been so clear and direct, now that he has embarked into this uncharted new territory? Dylan’s audiences would be negotiating that right through his UK tour of 1966. I guess I knew that they found him frustrating – I just never knew that they found him funny. Great project. Won’t you come see me, Queen Jane?